A lot has been said already about second-round draft pick Jerel Worthy and fourth-rounder Mike Daniels and what they could mean to the Packers’ defensive line in 2012. Both players have flashed in practice, but there has yet to be much to shout about during the preseason games. They’re hoping to change that Thursday in Cincinnati, obviously, and veteran D-lineman B.J. 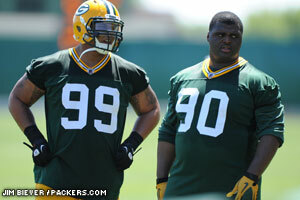 Raji believes it should only be a matter of time, because both youngsters entered the NFL with the right approach. “The thing I like about them, I see a lot of myself in them,” Raji said. “Jerel was a high pick, but he was willing to learn. He didn’t come in with the idea that he knew everything. He came in asking questions. Mike’s the same way. Raji added that there will be some tough decisions at cutdown time for the roster within his position group.